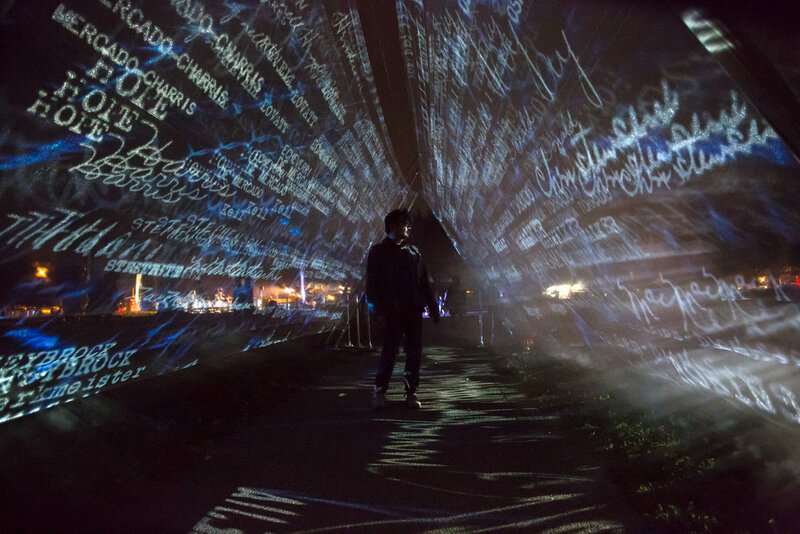 Klip Collective, led by video and light artist Ricardo Rivera, integrated projection with critical and celebratory storytelling in South Philadelphia’s Marconi Plaza. Rivera lives in the community and envisioned a monument to the multiple generations of immigrants, migrants, and refugees who have made it their home. For Passage :: Migration, he collected the surnames of numerous South Philadelphia families into one immersive text and installation. As Rivera stated, “The names pass over and around the viewer in waves, projected on translucent planes of fabric and smoke, creating a floating sensation. By entering, the viewer would become an active part of the installation, as the projections wash over their body. Like this country, once you enter, you are a part of it.” The artist gathered the names from passenger ship manifests from the Coast Guard Station at Washington Avenue, from books obtained by Monument Lab researchers from the University of Pennsylvania Libraries, and from publications produced by the Mural Arts Southeast by Southeast initiative. Passage :: Migration, was installed for a one-night-only viewing on October 28, 2017. Partners: Mural Arts Philadelphia, The City of Philadelphia, Philadelphia Parks & Recreation, and Friends of Marconi Plaza. Passage :: Migration was presented as a part of the Monument Lab: Philadelphia (2017) exhibition. Waves of people. Taking flight with hopes and fears. This immersive video installation surrounds the viewer with the surnames of families that came to Philadelphia through the years. 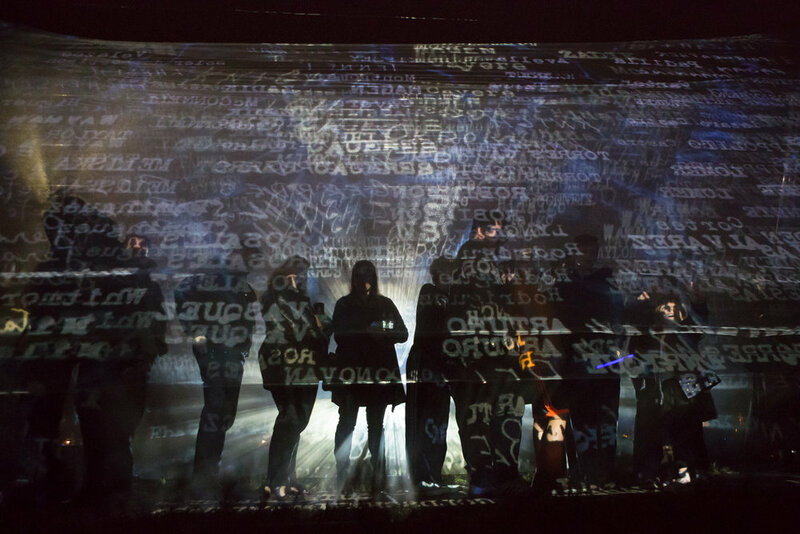 The names pass over and around the viewer in waves; projected on translucent planes of fabric and smoke, creating a floating sensation. By entering, the viewer is an active part of the installation, as the projections wash over their body. Like this country, once you enter, you are a part of it. 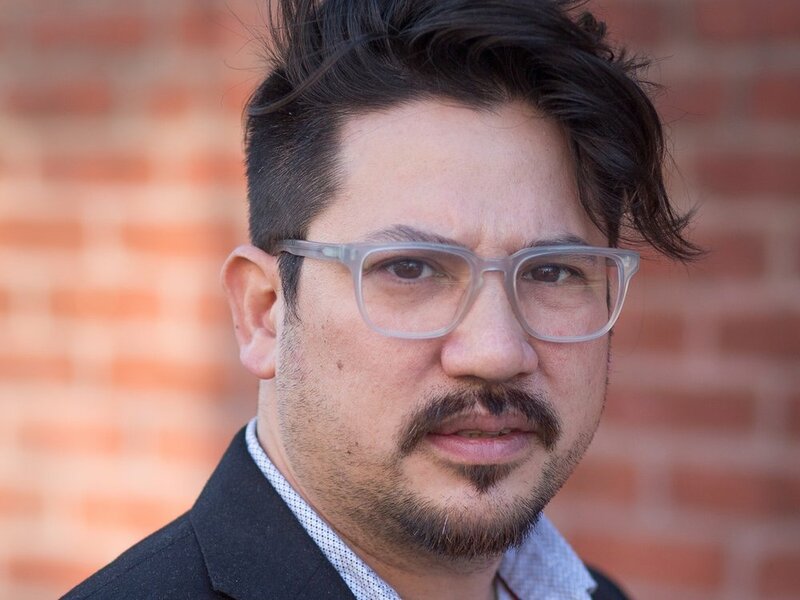 Ricardo Rivera is Creative Director and Co-founder of Klip Collective, an experiential art shop that integrates projection lighting and storytelling to create compelling experiences. Ricardo is a visual artist, filmmaker, and a true pioneer of video projection mapping, having earned a United States patent for his technological breakthroughs in the medium. His work has been featured multiple times at the Sundance Film Festival, including the commissioned festival bumper in 2014. Rivera directed Nightscape: A Light and Sound Experience at Longwood Gardens, which attracted over 175,000 visitors in 2015 and again in 2016. In the advertising world, brands including Nike, Target, NBC Sports, and Adult Swim have sought his unique ability to use video projection art as a bridge between architecture, technology, and storytelling. The common element in all of Ricardo’s work is groundbreaking creativity and technological innovation.